What Happens to Sugar Levels in the Blood While Fasting? Blood sugar levels are considered to be normal if they fall between 70 and 140 mg/dl. However, if serum glucose levels fall below 70 mg/dl, hypoglycemia or low blood sugar can occur. Not eating enough is a common cause of low blood sugar. A person may experience symptoms such as hunger, rapid heartbeat, trembling, sweating and shakiness when blood sugar drops too low. Depending on whether low blood sugar is mild or moderate, headache, mental confusion and seizures can also occur. Severe low blood sugar can lead to seizures, loss of consciousness, coma, brain damage and even death. In cases of short-term fasting, glucose levels in the blood should rise after eating a meal. A study published in a 2005 issue of "Clinical Nutrition" concluded that fasting is not a healthy way for people to diet. 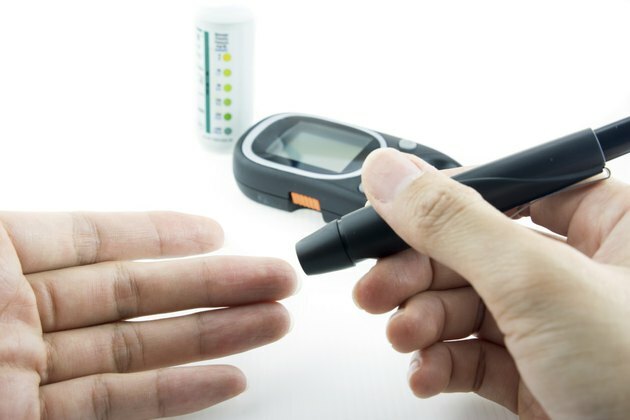 Researchers found that diabetics and overweight individuals without diabetes had problems with insulin and blood sugar after 60 hours of fasting. The digestive system is responsible for breaking food down into glucose, which is the body's primary source of energy. Glucose then travels in the bloodstream to cells throughout the body. This causes a rise in blood sugar levels. The pancreas releases insulin to aid cells in absorbing glucose for energy. For individuals with Type 2 diabetes who are insulin resistant, the cells do not respond to insulin the way they should. Excess glucose builds up in the bloodstream resulting in high blood sugar levels. But when a person does not eat, the body runs out of fuel, and blood sugar levels drop. In order to keep blood glucose levels stable, you need to eat several meals throughout the day. When the body is in a fasting state, it relies on stored energy. This energy comes from glycogen, protein and fat tissue. Glycogen stored in the muscles and liver is utilized as needed. Liver glycogen can supply any of the body's cells, but muscle glycogen can only be used by the cells in the muscle in which it is stored. When the body fasts, it depletes glycogen by using this stored energy to fuel the normal activity of the brain and other body systems. Simply sleeping at night is a fasting state that uses up most of the glycogen in the liver. What Causes the Blood Glucose Level to Increase in Liver Damage?